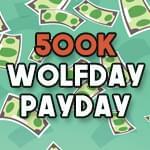 93.9 The Wolf wants to hook you up with $200 and give you a chance to win $500,000! All you have to do is listen to The Wolf weekdays at 9AM, 1PM & 4PM and when you hear the Cash Keyword, text that to 4-0-7-7-2. Sponsored by Your CBD Store in Erie, treating your life one drop at a time!